The inventory of homes for sale in Tallahassee remains far too low for the growing number of buyers in the market, yet we still aren't seeing builders producing homes at a pace that will help. In fact, instead of building more homes to at least keep pace with the buyers, we are seeing the new construction rate decline! Take a look at the new construction listings below as well as the report with charts and graphs that follows, and you will understand my concern. 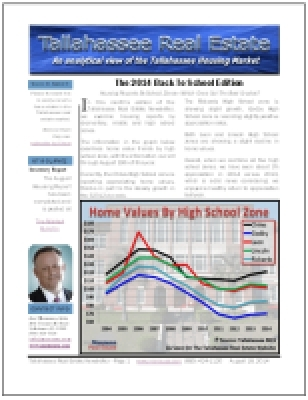 Our report also includes several graphs that provide valuable insight into the new construction market in Tallahassee. Additionally, we have included a table of the most recent new home sales in Tallahassee and it is located at the end of this report. 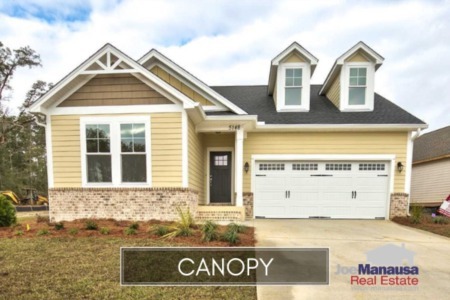 The listings above and the sales table below will be continuously updated into the future (meaning bookmark this page if you always want to know the current status of new construction homes in Tallahassee). The following graph clearly shows the imbalance in the market. New home sales are plotted in brown, while existing home sales are shown in green. The red line shows the ratio of new home sales to all home sales (new construction market share). 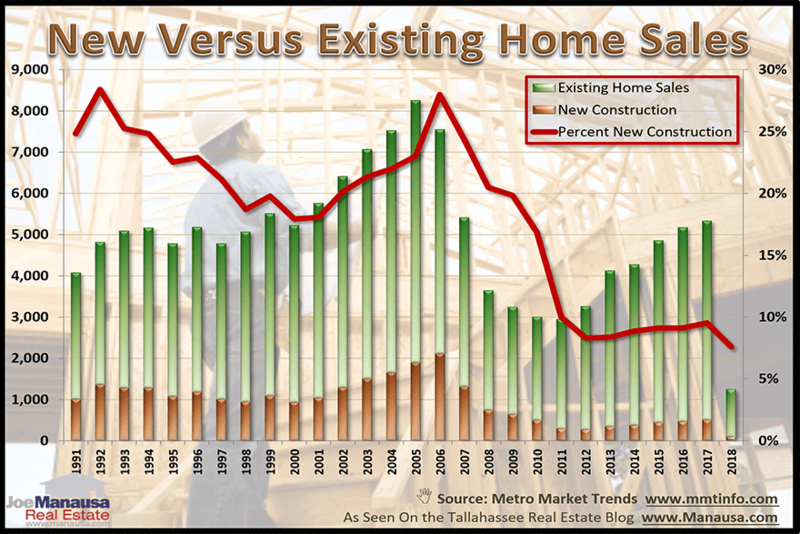 Through March of this year, new home sales only represent 8% of all homes sold in Tallahassee. To put this into perspective, in the 1990s, roughly 21% of all home sales were new construction. Even at the very bottom of the housing market correction, new home sales were a greater percentage of the market than what we are observing today. While the title of this report claims 28+ year low, the reality is that it could very well be much longer than that. My data only goes back to 1991, and the ratio at the beginning was around 23%. How far back from 1991 would we need to go to find 8%? How Expensive Are New Homes? One factor that explains why existing home sales are doing so well right now is the value differential between new and used. The graph above shows that buyers are paying about a 50% premium when buying new versus used. Of course, this is not comparing apples to apples. The new homes are brand new with all new modern appliances and fixtures, while the existing homes are typically well worn but the land under the typical resale is superior in size and location to most new homes. Regardless, tracking this "new construction premium" over time is a useful way to identify the relative affordability of new construction. As this measurement remain towards the higher end of the spectrum, we can expect resale values to continue higher to close the gap. Once we see this differential reach its historical "normal" level (between 30% and 40%), we should anticipate a significant growth in demand of new homes. Another trend we like to track is annual building permits versus annual sales. This graph shows the average monthly permits issued for new homes (red line) versus new home sales (green line). What we are looking for from this graph is times when there is great separation between the two trends. The past ten years show that sales followed permits very tightly, meaning the homes being built were selling. 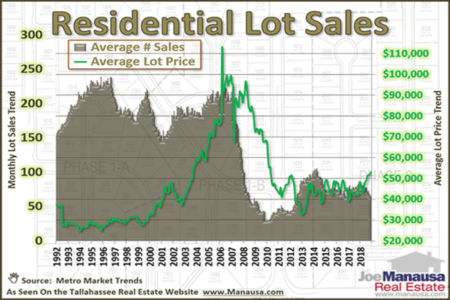 Currently, there is a small separation between the two, and we'll have to monitor this to see if we are adding to the inventory of new homes for sale in Tallahassee. As of this morning, there are 206 new homes for sale in the Tallahassee MLS, and 74 are already under contract (36%). This is consistent with what we are seeing from existing homes, so I do not believe the small spike in permits will create an inventory issue. One interesting observation is that the median price of new homes under contract ($327,700) is higher than the median price of new homes for sale that are not under contract ($291,200). Prudent builders should definitely study the market before deciding what and where to build. The following table shows 1,000 recent new home sales in Tallahassee. 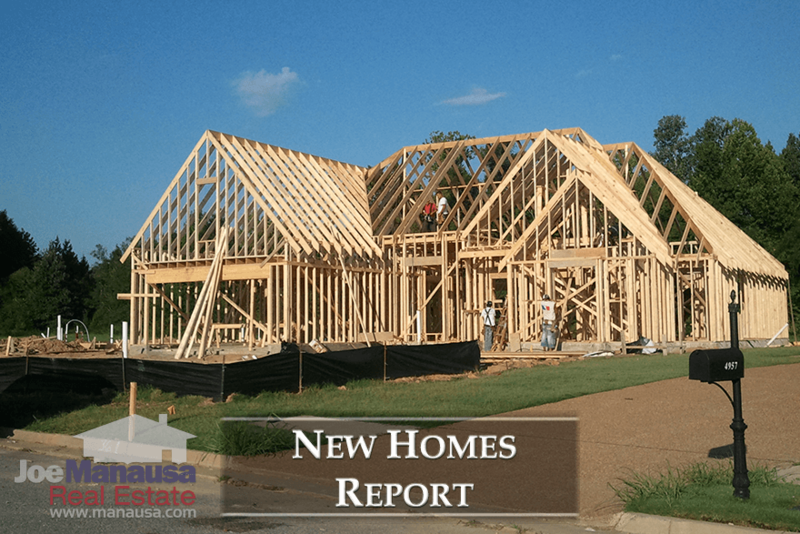 This concludes our April 2018 update on new home construction sales, please give us a call at (850) 366-8917 or drop us a note if you have questions about buying or building a new home. If you want to know what people are saying about working with Joe Manausa Real Estate, you can see hundreds of real customer reviews reported on Google, Facebook and Zillow right here: http://www.manausa.com/testimonials.